Top row, Left to Right, Model 1 Nuclear Measurements GS-3CD, Model 2 Victoreen Vico 661, Model 3 International Pump and Machine Works IP-700, Model 3 Chatham CH-700, Model 4 Universal Atomics, Model 5 Anton Electronic Labs. Bottom row, Left to Right, Model 6 Anton Electronic Labs, Model 6 Victoreen Inst. Co., Model 6A Victoreen Inst. Co., Model 6B Victoreen Inst. Co., Model 6B Lionel Electronic Labs, Model 6B Electro-Neutronics Inc. Click photo to see larger version. CD-V700 radiation survey meter is a sensitive low-range instrument that can be used to measure gamma radiation and detect beta radiation. 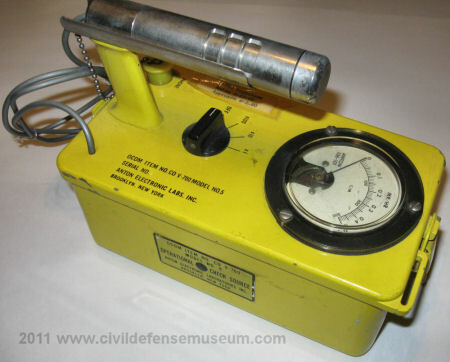 It is recommended for (1) monitoring of personnel, food and water when used in a shielded facility or an area of low radiation background, and (2) follow-up monitoring or areas for human habitation and food production. 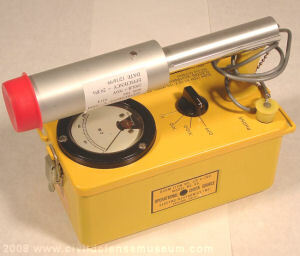 The instrument is also used in training programs where low radiation dose rates are encountered. 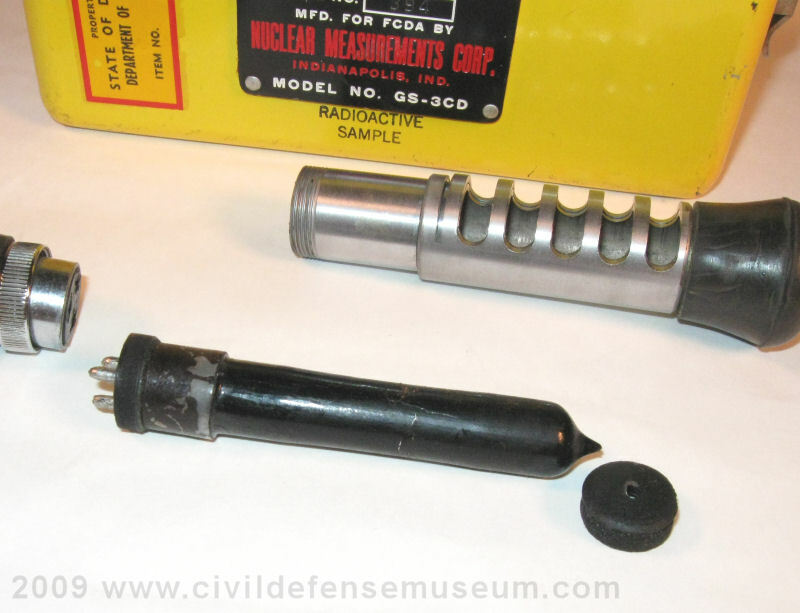 The detecting element (see photo above) of the CD V-700 is a Geiger Mueller (GM) tube with an adjustable probe shield so that only a gamma radiation dose rate is measured beta and gamma can be indicated together with the probe shield open (see photo above). 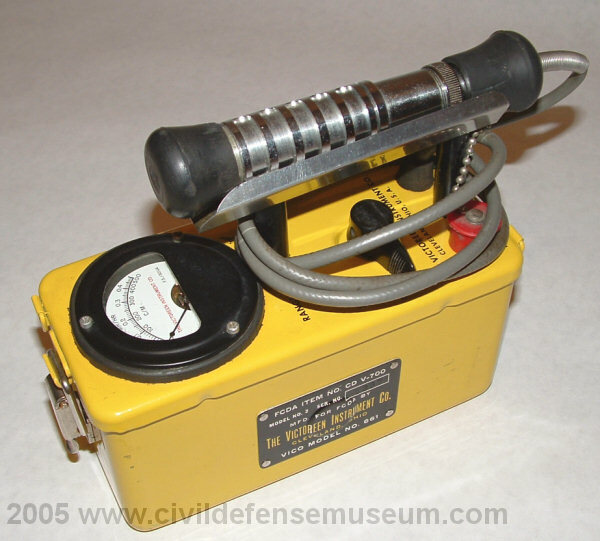 This instrument is designed for sensitive measurements and has very limited usefulness in areas of high [radioactive] contamination. 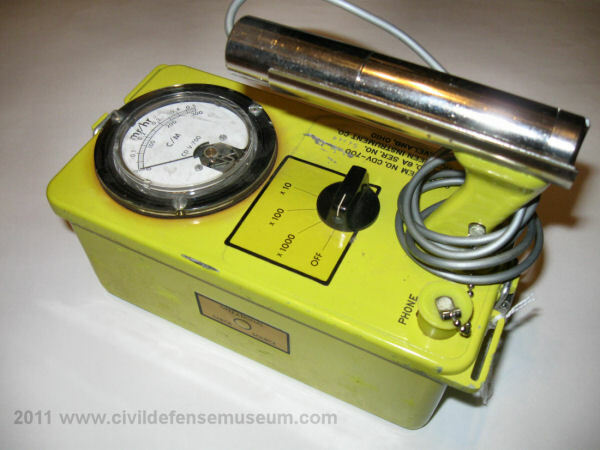 In radiological defense operations, during periods of high radiation intensity, the instruments [CD V-700] would have to be used in locations well shielded from fallout radiation where food, water, and personnel could be checked for contamination. During the later recovery period, it [CD V-700] will be used to locate remaining sources of contamination that might need to be removed for long-term occupancy. 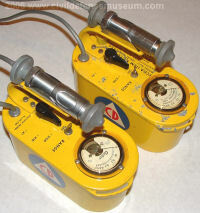 A special Geiger tube can be used to shift the range of this instrument upwards by a factor of 10; that is to 0-5, 0-50 and 0-500 milliroentgens/hour. Side check source/ ID plate. this old style glass GM tube. The first CD V-700 was the Nuclear Measurements GS-3CD. 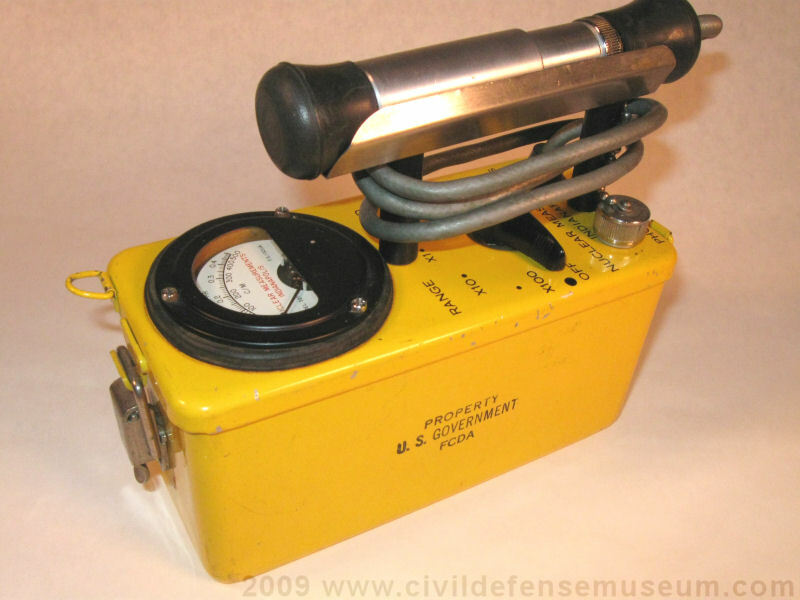 This instrument is referred to as the Nuclear Measurements GS-3CD/CD V-700 Model 1. The CD V-700 Model 1 and 2 along with the CD V-710 Model 1 are the only instruments that have the original manufacturers model number along with the OCDM model number. 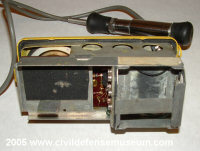 Pictured above is the CD V-700 Model 1/GS-3CD. The CD V-700 Model 1 case bottom didn't have the usual CD emblem like the later CD V-700s. 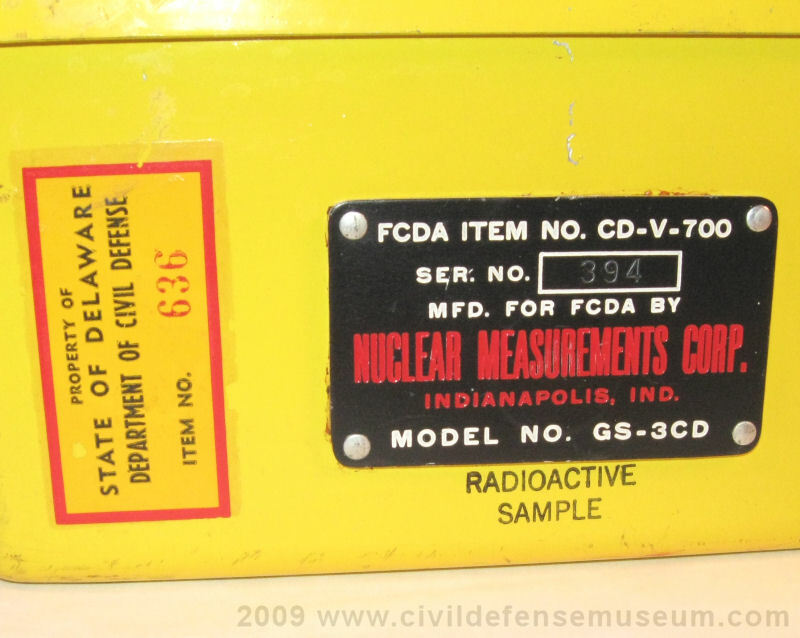 The CD V-700 Model 1 had "Property U.S. Government FCDA" ink stamped on the side. 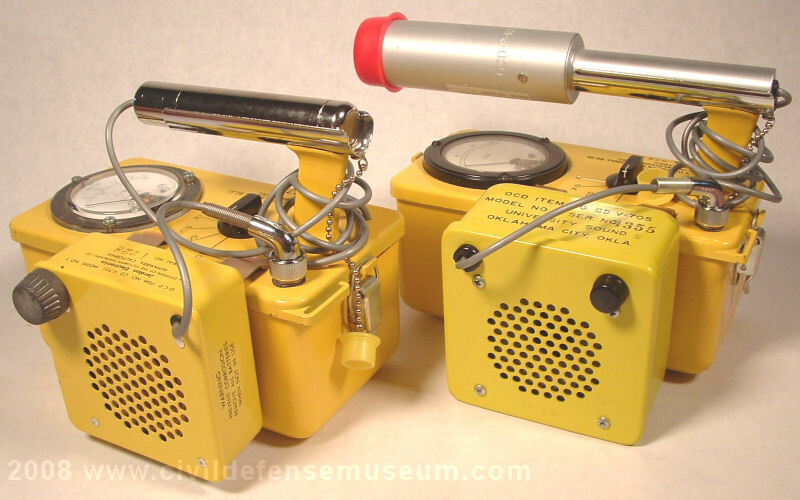 The CD V-700 Models 1 and 2 both used glass GM tubes seen in the lower left photo above. 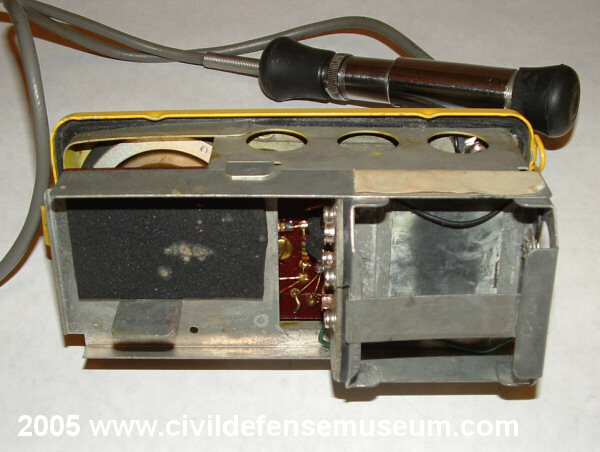 The lower right photo above shows a Nuclear Measurements GS-3 prospecting counter. This was the Nuclear Measurements version of the instrument sold to the public for uranium prospecting. This unit's meter only has a C/M (counts per minute) scale. 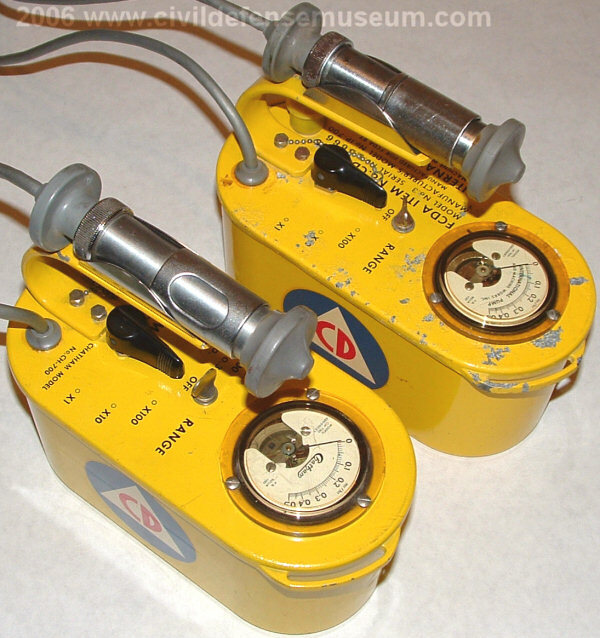 The GS-3 is the same as the GS-3CD except of the color and the GS-3 has a larger probe and GM tube. 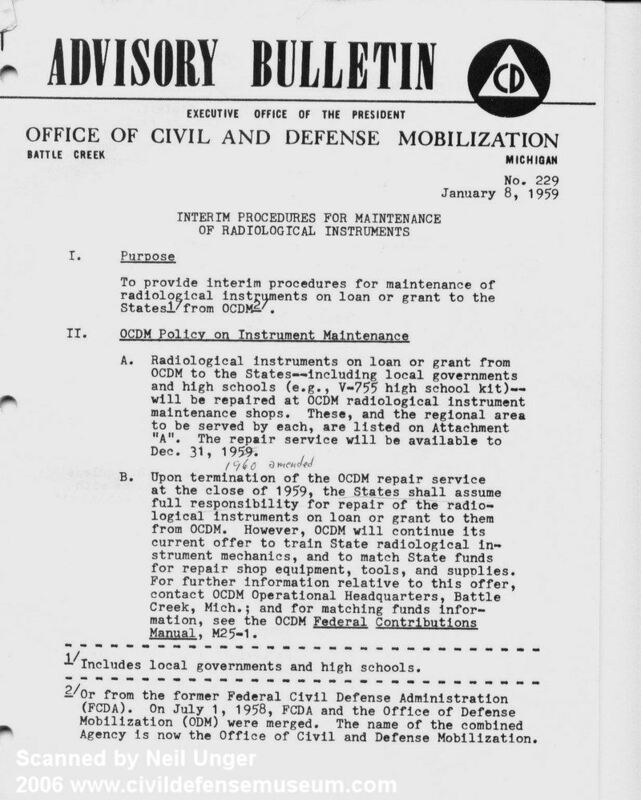 Here are some pages from the OCDM Advisory Bulletin No.229, Interim Procedures For Maintenance Of Radiological Instruments, Dated Jan. 8 1959. 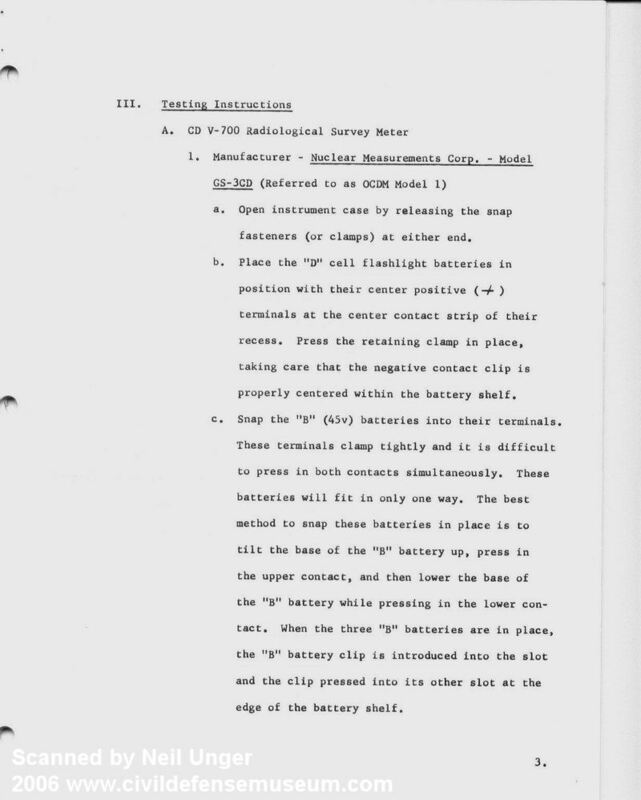 Here are links to scans of the cover and 4 pages of the bulletin that mention the CD V-700 Model 1 and Model 2. Cover Page Page 3 Page 4 Page 5 Page 6 Page 7 Thanks to Neil Unger for scanning the pages of this document! GS-3CD/OCDM CD V-700 Model 1. The CD V-700 Models 1-3 all take 3-45 volt and 2-1.5 volt D-cell batteries. This battery tray is hinged at the side. I finally got another CD V-700 Model 2. This unit is in far better shape than the first Model 2 I had. 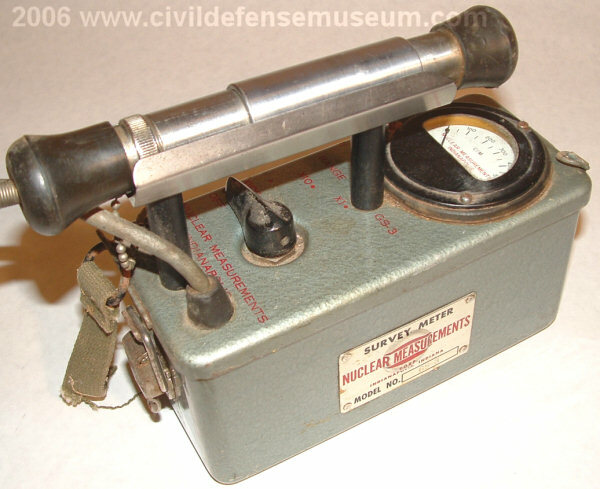 Manufactured by Victoreen Instrument Company this meter is almost identical to the Nuclear Measurements CD V-700 Model 1. 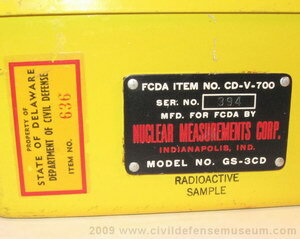 The battery holder frame of this meter has "Nuclear Measurements Corp. stamped into it. The schematic is glued over the edge of the frame where the stamp is. 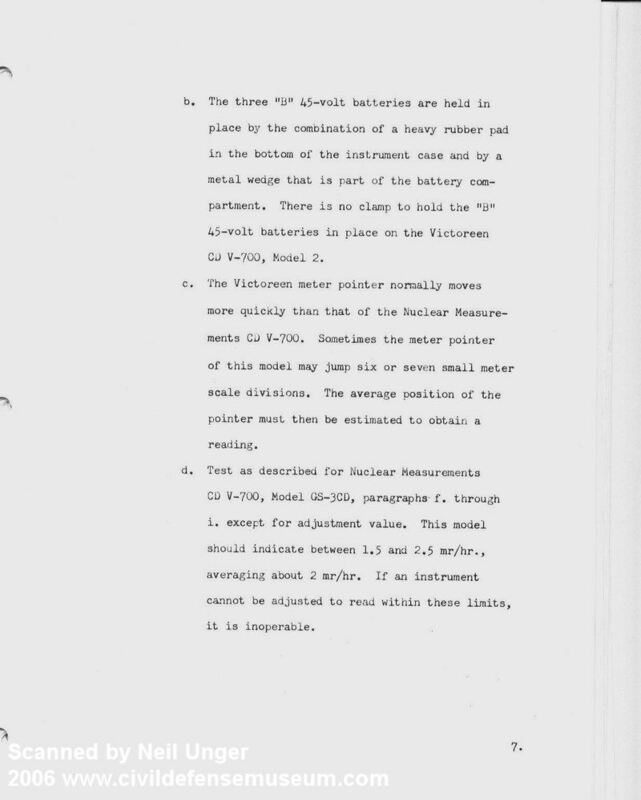 It looks like Victoreen might have bought the design from Nuclear Measurements way back when. 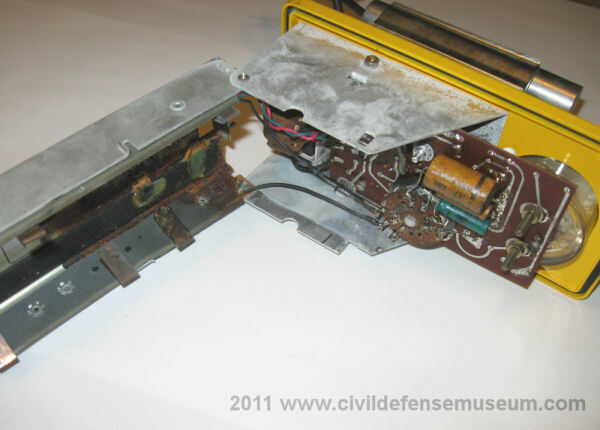 I think this is one of the very few CD V-700 Model 2s that had the batteries removed when not in use. There is no battery corrosion in this thing at all! I thought this was so amazing I included a photo of the clean inside of the case. CD V-700 Model 3 Chatham & International Pump and Machine Works. Here are some photos of the CD V-700 Model 3. The Chatham & IPMW CD V-700 Model 3s are the most unique CD V-700s with their rounded cast aluminum construction. I have an IPMW Model 3 manual and almost all the part numbers in the manual parts list are Chatham part numbers. Maybe IPMW took over the contract from Chatham. My IPMW unit is pretty rough with bad paint chipping. The CD V-700 Model 3s still have manufacturers part numbers on them in addition to the CD V-700 number. 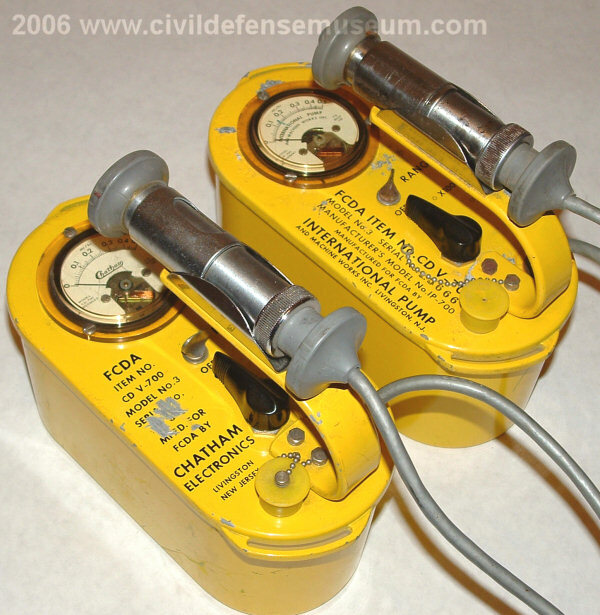 The Chatham is CH-700 and the IPMW is IP-700. Later model CD V-700s didn't have manufacturers part numbers on them. The CD V-700 Model 3s check sources are on the bottom of the case. 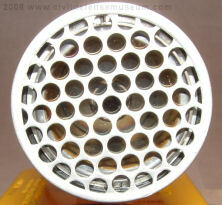 The source is located in a recessed hole cast into the center of the case bottom. 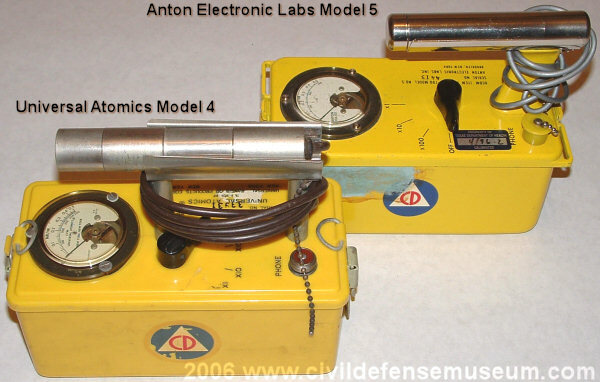 CD V-700 Models 4 Universal Atomics & 5 Anton Elec. Labs The CD V-700 Model 4 (left in photos) by Universal Atomics is the only plastic-case CD V-700 that I know of and is by far the poorest quality CD V-700, in my opinion. 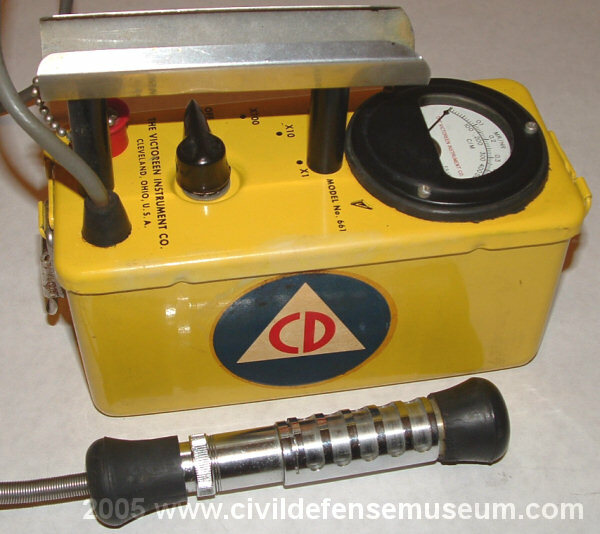 It was the first CD V-700 to use only D-cell batteries though which was a plus. I guess I think of it as the poorest quality model because the 2 I have are in really rough shape because of the deterioration of the plastic case (material cracking, breaking off of the latch tabs etc). The CD V-700 Model 5 manufactured by Anton Electronic Labs (right in photos) is a nice little unit. All of these that I have are in really nice shape and are really cool little CD V-700s. The Anton Model 5 uses 5 D-cell batteries too. Click photos to enlarge. In 1960-61 the CD instrument funding started increasing again after steadily declining since 1956. With that increase in funding the CD V-700 Model 6s arrived. 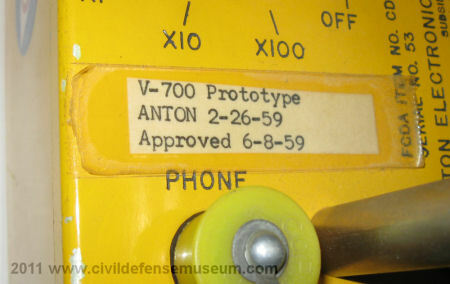 The CD V-700 Model 6s by Anton and Victoreen were the first of the larger case CD V-700s. All the previous CD V-700s had smaller cases. 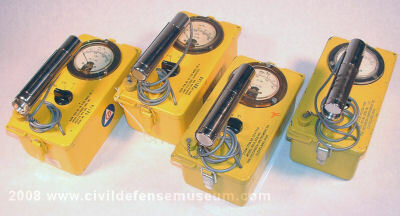 I wish I could find the original Civil Defense specifications for these instruments. It would be interesting to see what changed in the specification between the earlier models 1 through 5 and model 6 CD V-700s. When comparing the Anton Model 5 and 6 side by side they appear to be the exact same instrument circuitry-wise. The only difference I see in the Anton Model 5 and 6 is the case and the larger indicating meter on the Model 6. There are also a few Lionel CD V-700 Model 6s out there. The one that I have has an Anton Model 6 case bottom. Actually it appears to be an Anton Model 6 with the Lionel name on it. I have never seen a Lionel CD V-700 6a. That doesn't mean that one didn't exist though. 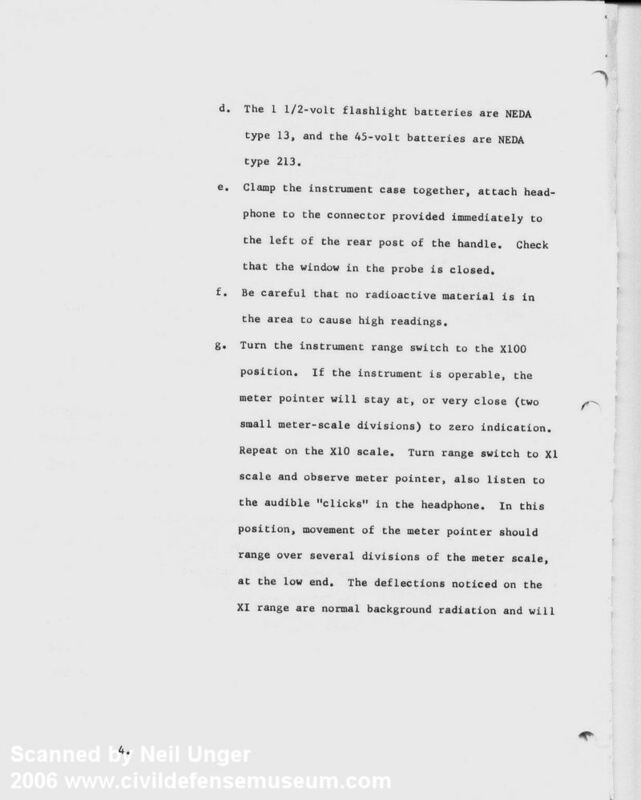 According to Dr. Frame's Health Physics Historical Instrumentation Collection site Lionel took over Anton which would explain the mixed parts and mixed logo markings on some of the instrument manuals. Also released in 1961 was the CD V-700 Model 6A. 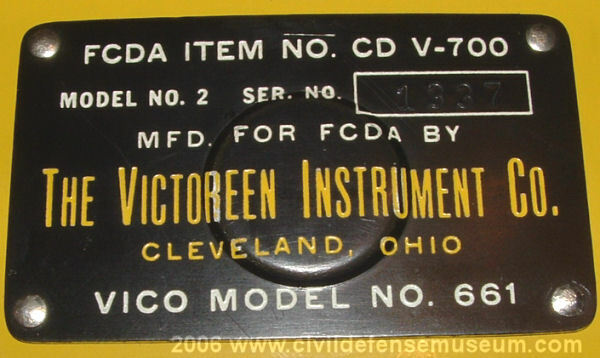 Victoreen was the only manufacturer of the CD V-700 Model 6A. I don't know what the difference in the Victoreen Model 6A and the Model 6 might be. 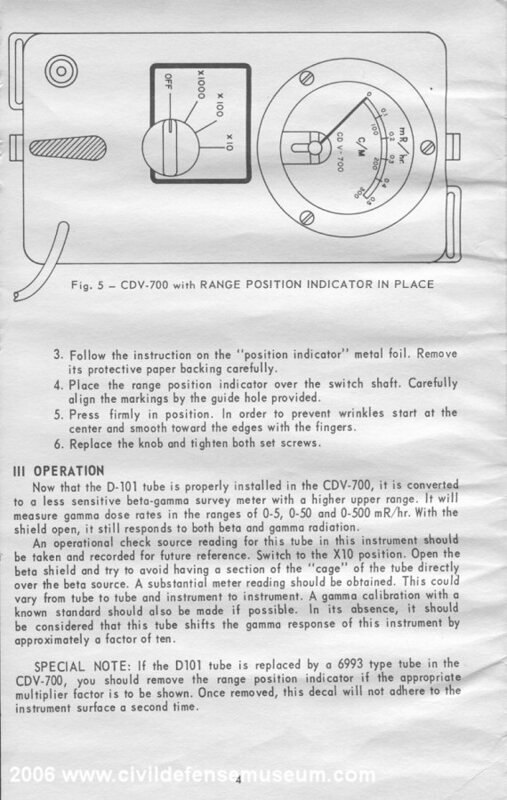 The Victoreen Model 6 and 6A use the same instruction and maintenance manual and appear to be the same instrument. Pictured in the photo are a Lionel, Anton, Victoreen CD V-700 Model 6 and a Victoreen CD V-700 Model 6a. 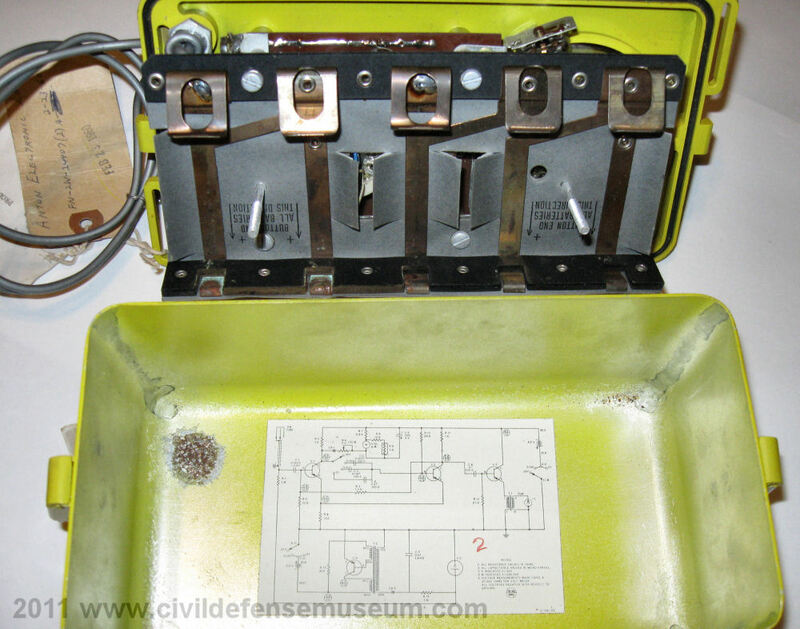 In 1962 Civil Defense instrument funding absolutely exploded! 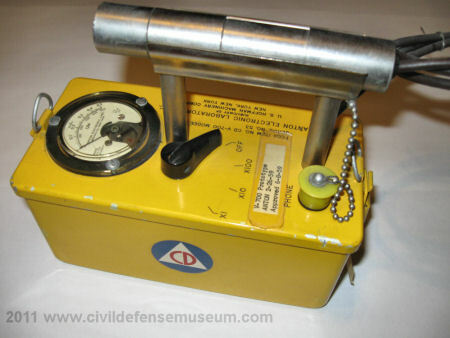 With the introduction of the CD V-715 high-range survey meter to fill the newly surveyed fallout shelters being stocked with supplies the CD V-700 Model 6Bs also arrived. 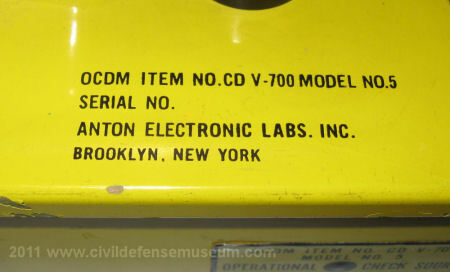 Victoreen Instrument Co. and Lionel Electronic Laboratories (yes the same folks who gave us the toy trains) were the first manufacturers of the CD V-700 Model 6Bs in 1962 and 1963. The Victoreen Model 6B is pretty much the same as the Victoreen Model 6A except for some electronic circuitry changes. The Lionel CD V-700 Model 6B is a little bit different than the Victoreen CD V-700s in that it only uses 2-D cell batteries instead of the 4-D cells that the Victoreen units use. 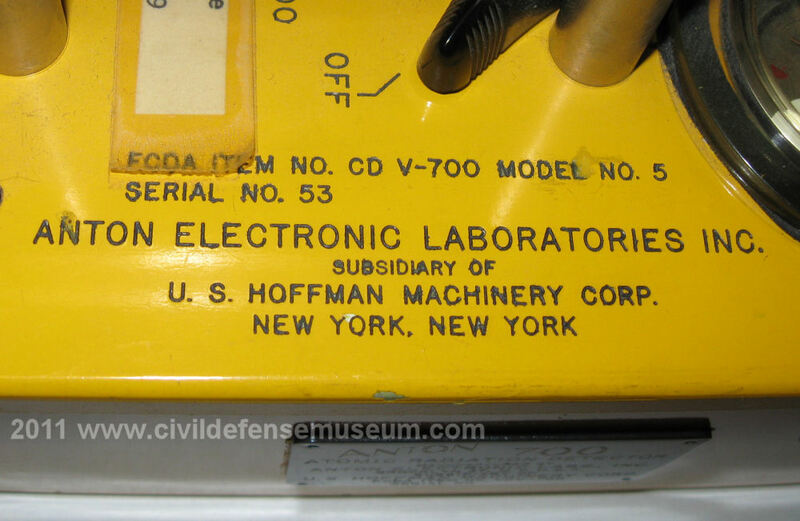 Electro-Neutronics Inc."ENI" also manufactured a CD V-700 Model 6B. 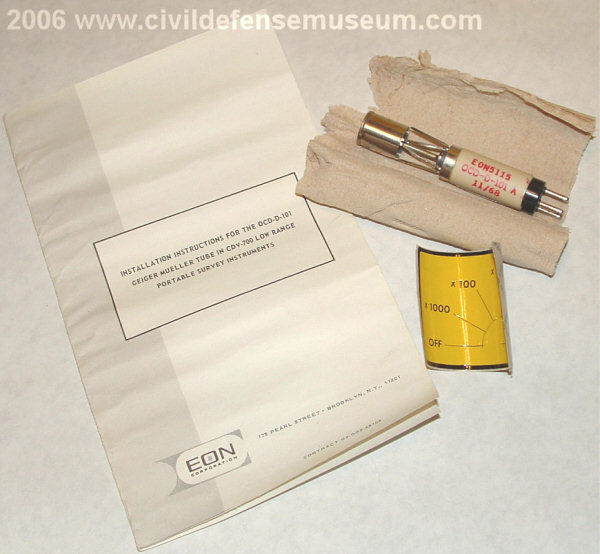 The ENI CD V-700 Model 6B came out in 1964 being one of the last "new" issue Civl Defense instruments with the CD V-717 and CD V-715 Model 1B. 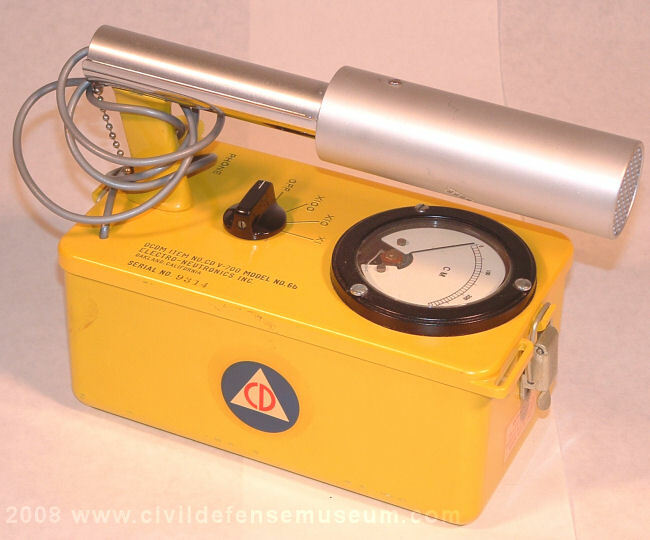 1964 was the last year for Civil Defense instrument funding at only about 1/10th the amount of funding appropriated just 2 years earlier in 1962. From left to right in the photo are a Victoreeen, Lionel and Electro-Neutronics CD V-700 6Bs. Click photo to see larger. My YouTube Video Of A CD V-700. CD V-700M. Modified CD V-700 To Detect Alpha radiation. Use of the CD V-700 for Alpha Emitters. 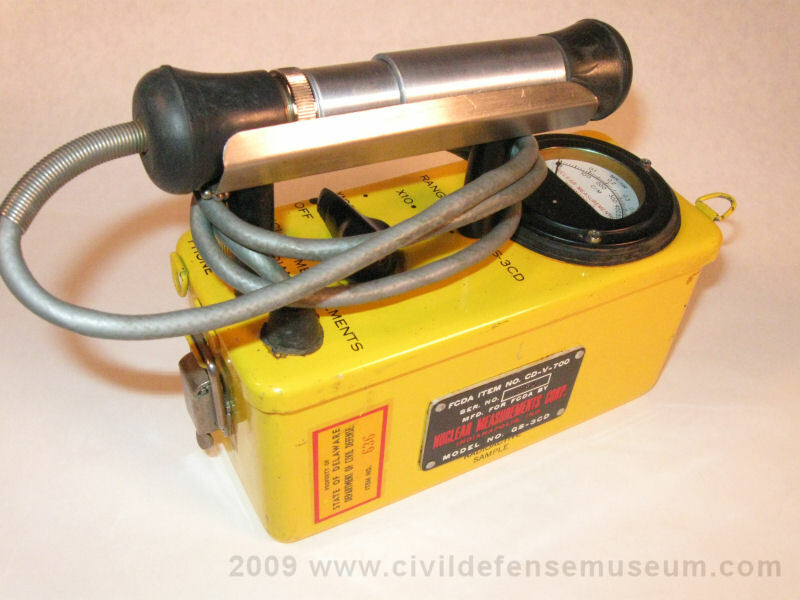 The standard CD V-700 will neither detect nor measure alpha radiation. The wall of the standard CD V-700 Geiger tube is much too thick for even the most energetic alpha radiation to penetrate. A special thin window Geiger tube which will detect alpha radiation has been developed for use with certain models of CD V-700 instruments. 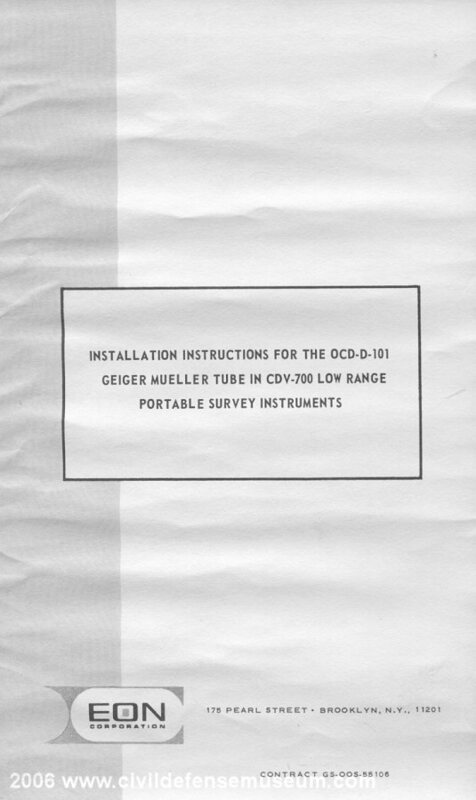 With such a Geiger tube installed, the instrument is designated the CD V-700M. 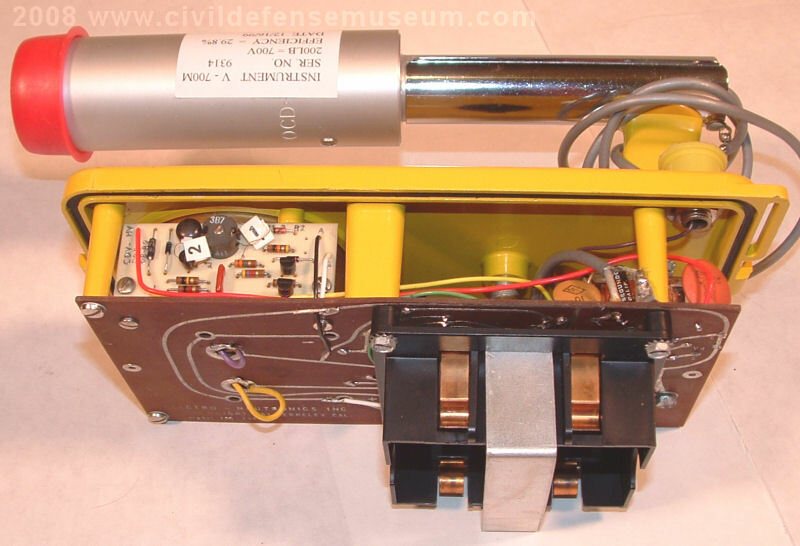 The electronic circuitry of the CD V-700M has been modified to accommodate this type of detector. The CD V-700M may be used to detect the presence of an alpha emitter but would not provide a measure of the hazard. 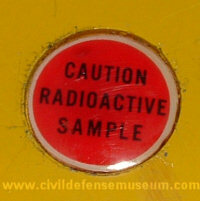 It would also detect any beta or gamma radiation present. As is the case for beta emitters, specialized equipment and techniques are required to measure an alpha radiation hazard. Most States have a few of the CD V-700M survey meters. 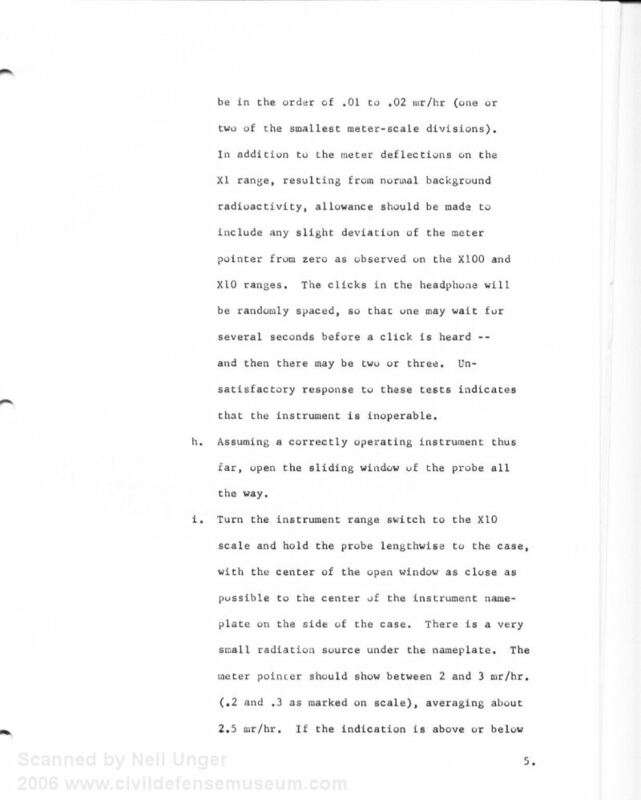 FEMA CPG 4-1 CD V-700M Related Documents. 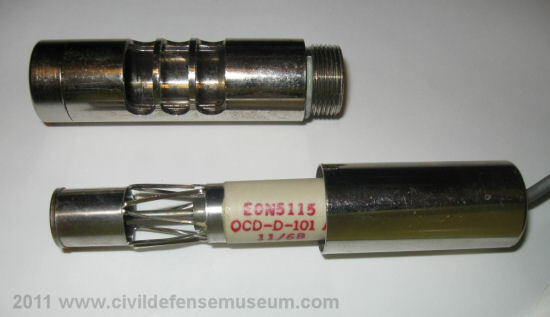 "The OCD-D-101 GM tube is designed for use in the probe of the CDV-700. 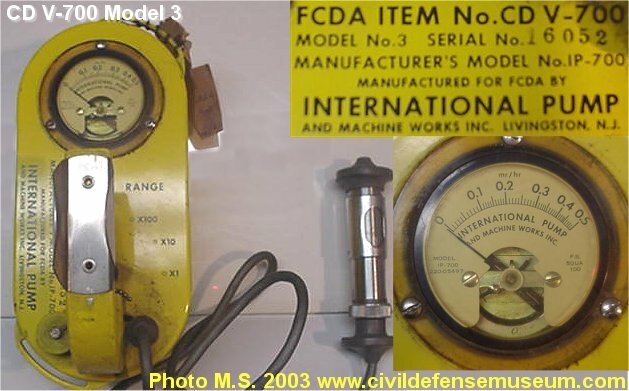 It may be used in place of the 6993 type geiger tube when it is desired to decrease the sensitivity of the CDV-700 survey meter. 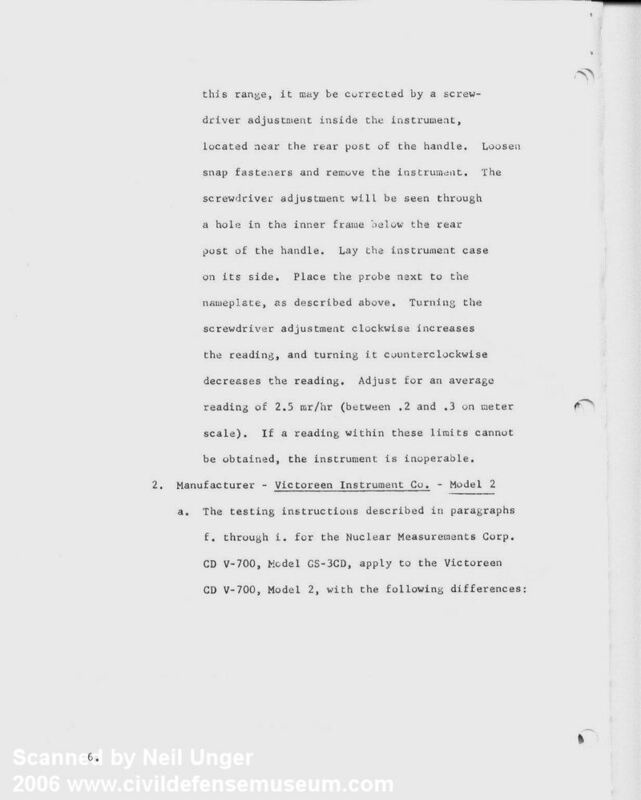 The gamma sensitivity of the D-101 tube is one-tenth that of the 6993 tube, therefore, the gamma sensitivity of each range on the CDV-700 is correspondingly decreased by a factor of ten. This extends each operating range of all CDV-700 models by a factor of ten. 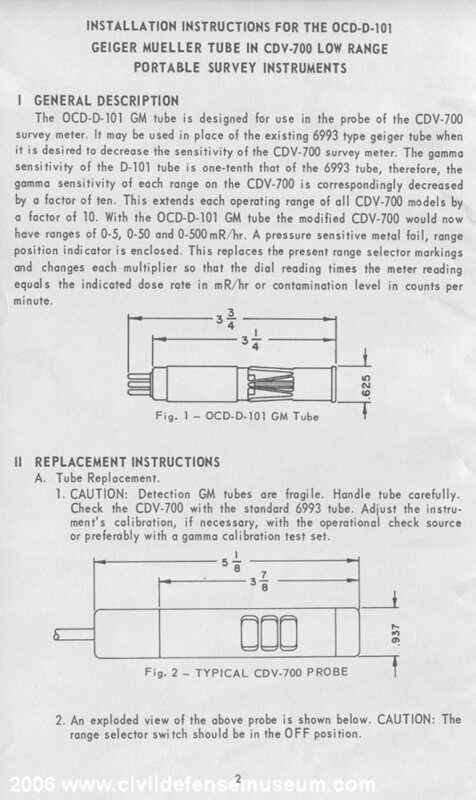 With the OCD-D-101 GM tube the modified CDV-700 would now have ranges of 0-5, 0-50 and 0-500mR/hr. A pressure sensitive metal foil, range position indicator is enclosed. This replaces the present range selector markings and changes each multiplier so that the dial reading times the meter reading equals the indicated dose rate in mR/hr or contamination level in counts per minute." 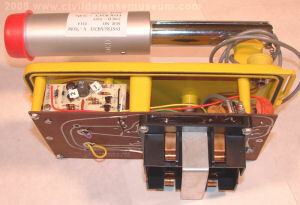 Here is a close-up of the EON G-M tube. 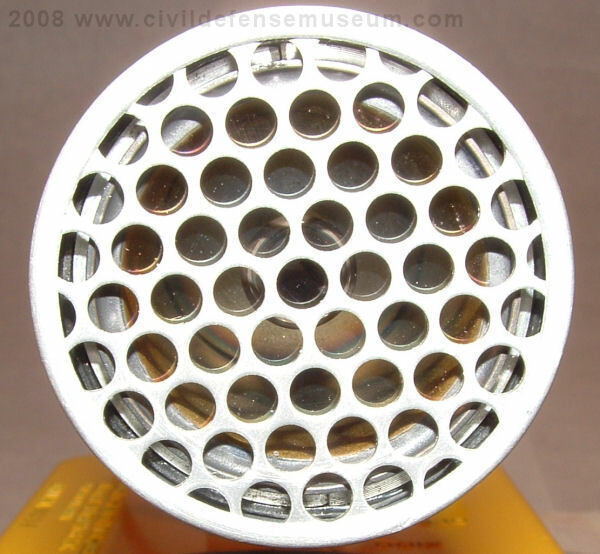 The detecting section of the tube is the thin diameter tube in the center of the "caged" section. Here is the EON G-M tube kit. The kit is just instructions, tube and a sticker. 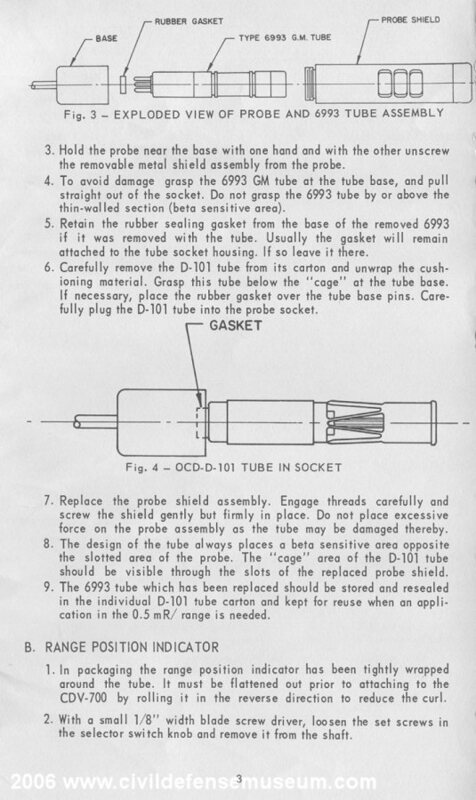 This kit could have been installed on any Model 6 or higher CD V-700. Here is PAGE 1 PAGE2 PAGE 3 and PAGE 4 of the EON manual seen in the above photo. Special Thanks to Paul Frame for this kit! The CD V-705 speaker was issued to aid as a substitute for the headphones in radiological training classes. As far as I know there are only 2 models of the CD V-705 speaker. 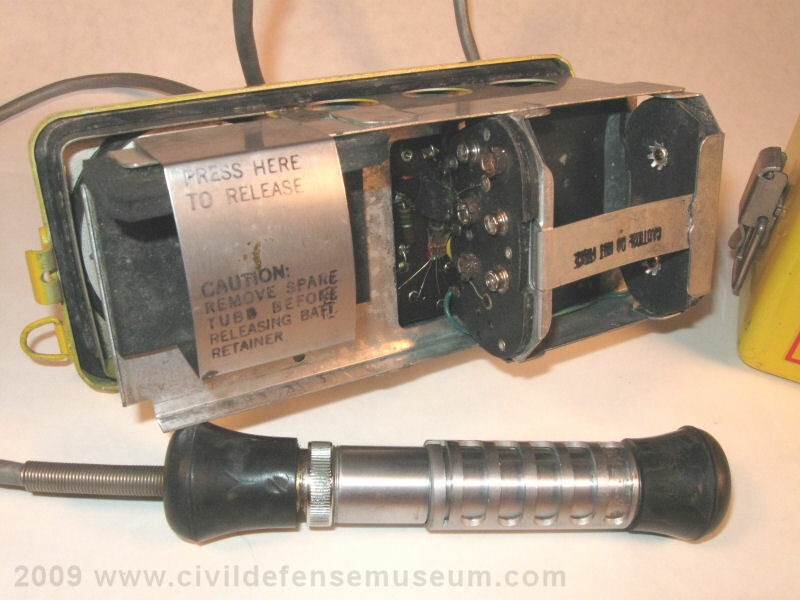 The CD V-700 on the left has a Model 1 clipped to it's side and the one on the right has a Model 2. Jordan Electronics made the Model 1 which appears to be simply a dosimeter charger case converted for speaker use. Univerity Sound made the Model 2 which is a bit larger that the Jordan unit. Both speakers use metal clips to hang onto the side of the CD V-700. Click on the photo to see a larger version. Special Thanks to M.S., George .B. and Mike R. for the CD V-705s! Here are some very unique CD V-700s I have in my collection. A huge thanks goes out to M. Mathis for the instruments shown on this page. Mr. Mathis was very kind to donate these to my museum collection. If I remember correctly Mr. Mathis found these prototypes in with a large lot of instruments he purchased at a FEMA auction around 1998 or 1999. The above suggests to me that this is the prototype for the Anton CD V-700 Model 5. 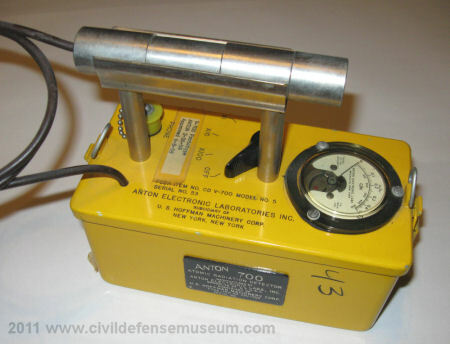 The interesting thing is that it looks just like a Universal Atomics CD V-700 Model 4. The Universal Atomics Model 4 was manufactured with a plastic case but this prototype Anton Model 5 case is all metal. The inside is the same as a Universal Atomics Model 4 also. I've never seen another one of these. I'm wondering why the Serial Number is 53. Where there 52 others before this one? If it's a prototype I would think that it would be Serial No. 1. Who knows. Here are some close-ups of the various identification labels on the case. The case side label plate does have a check source underneath although it doesn't say that on the plate. The plate is simply glued in place even though it has rivet holes at the corners and there is also no serial number on it. 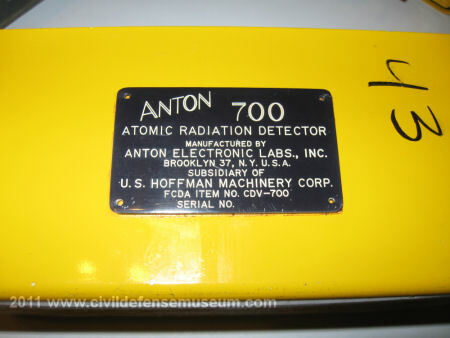 Also note that the side plate says ANTON 700 but then at the bottom of the plate it says FCDA ITEM CDV-700. Is the 2-26-59 date the build date or the date it was submitted for approval? I don't know. There are two taped-on labels which are identical. One on the case top and one on the case bottom. I have no idea if the "43" on the side of the case has any significance. Here's a photo of the inside of the instrument. It's a Universal Atomics battery frame and electronics. This raises a whole other set of questions. Did Anton buy the design from Universal Atomics and then change it to a their own Model 5? 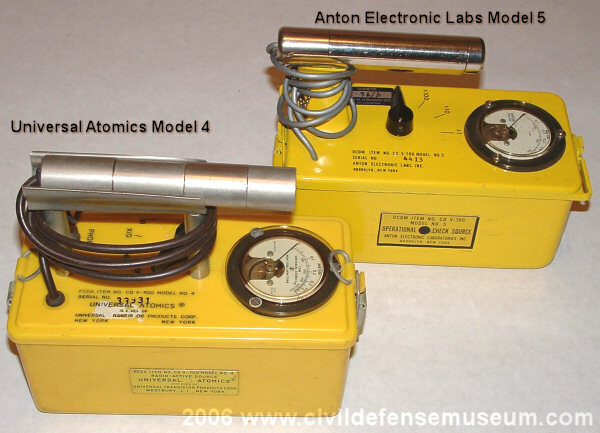 Are there any more Anton Model 5s out there with Universal Atomics Model 4 electronics? Again. Who Knows? I have no idea what is going on with this one. It says on the case it's an Anton CD V-700 Model 5 but it's in the slightly larger Anton Model 6 case. The Anton CD V-700 Model 6 case is the same standard case size as all the other later model CD instruments. It's tagged and labeled with the taped on labels that say it's a prototype. 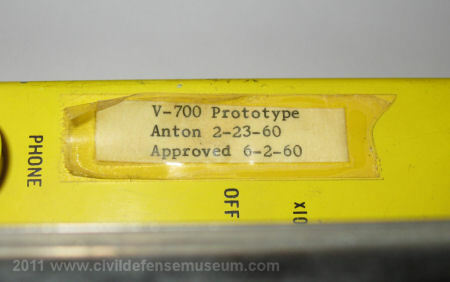 The Anton CD V-700 Model 5's that I have seen are all slightly smaller cases which are similar in size to the CD V-700 Models 1 through 4. I think that this is either a prototype for the Anton Model 6 or a larger case Anton Model 5. If it is a prototype for the Anton Model 6 I can't figure out why it's not marked as a "Model 6" instead of "Model 5" on the case. I don't know. The case size is what's throwing me on it. The most interesting thing about this instrument to me is that there is no serial number on it and there is no evidence of one ever being on it. Inside it appears to be identical to the smaller case Anton CD V-700 Model 5. In other words, again, I have no idea what this thing is. Here are some photos. Here are the various identification markings on the case. There is no serial number on the main identification label. There are two taped on prototype date labels. There is one taped-on label on the case top and one on the case bottom. 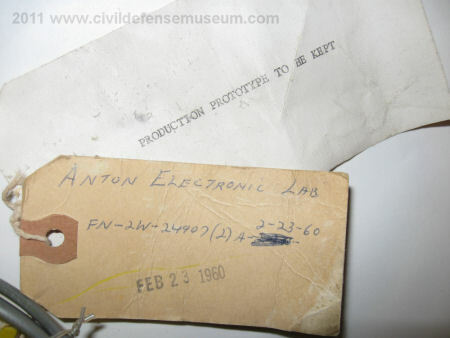 The dates are almost exactly a year later to the day from the taped-on labels on the Anton Model 5 prototype at the top of the page. This instrument has two tags tied to the case strap loop. One reads "PRODUCTION PROTOTYPE TO BE KEPT" and the other tag reads "ANTON ELECTRONIC LAB, FN-2W -24907(2)A-2-23-60, FEB 23 1960."